After leaving Uncle Chester's homestead claim, orphan Hattie Brooks throws a lasso around a new dream, even bigger than the Montana sky. She wants to be a reporter, knowing full well that a few pieces published in the Arlington News will not suffice. Real reporters must go to Grand Places, and do Grand Things, like Hattie's hero Nellie Bly. Another girl might be stymied by this, but Hattie has faced down a hungry wolf and stood up to a mob of angry men. Nothing can squash her desire to write for a big city newspaper. A letter and love token from Uncle Chester's old flame in San Francisco fuels that desire and Hattie jumps at the opportunity to get there by working as a seamstress for a traveling acting troupe. This could be her chance to solve the mystery of her 'scoundrel' uncle and, in the process, help her learn more about herself. But Hattie must first tell Charlie that she will not join him in Seattle. Even though her heart approves of Charlie's plan for their marriage, her mind fears that saying yes to him would be saying no to herself. Hattie holds her own in the big city, literally pitching her way to a byline, and a career that could be even bigger than Nellie Bly's. But can making headlines compensate for the pain of betrayal and lost love? Hattie must dig deep to find her own true place in the world. 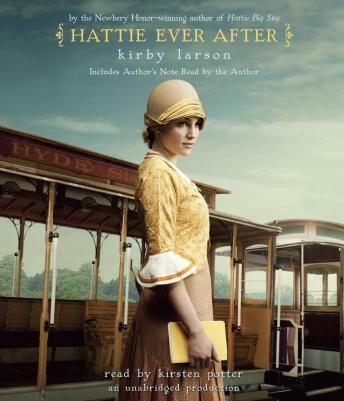 Kirby Larson once again creates a lovingly written novel about the remarkable and resilient young orphan, Hattie Inez Brooks.